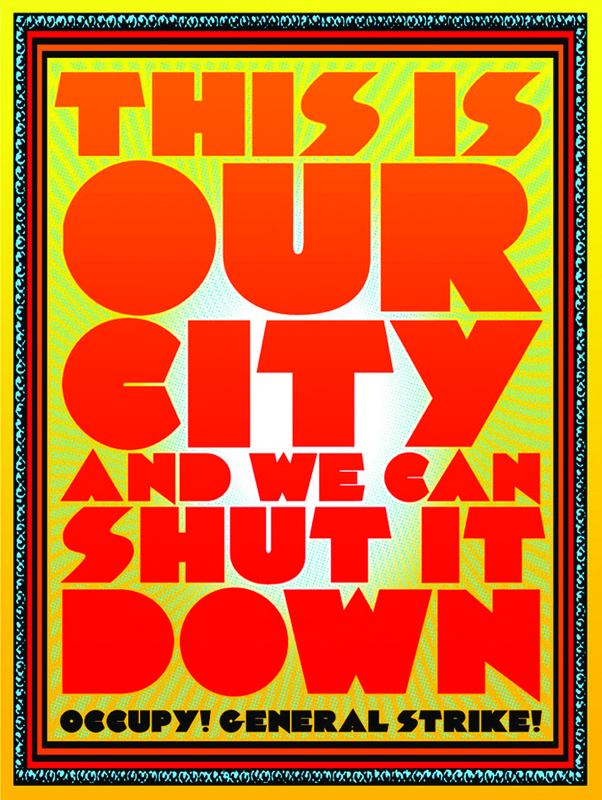 Usually, you have to wait a few years for a museum to get around to evaluating the defining art of a political movement, but the Yerba Buena Center for the Arts in San Francisco jumped right in with "Occupy Bay Area." 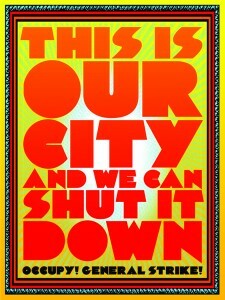 In fact, it's a fair bet the exhibit will end (October 14th) before the movement does. There is a lot of local art to point to. Anybody who attended (or covered) a protest will recall a sea of posters, some hastily drawn on whatever piece of cardboard was handy. Others showed a sophisticated, even professional artistic eye, and that's what caught the attention of curator Betti-Sue Hertz. "I realized there was something really special going on." The bright colors fairly pop off the center's plain white walls. Juxtaposed against photos and video of Occupy protests, it's pretty clear how the poster art fed into the energy of the crowd, and vice versa. "The range of styles is incredibly fascinating," says Hertz, noting that many artists consciously drew on the legacies of historical labor and social movements: the Free Speech Movement at UC Berkeley (1964), the five-month long student-led strike at San Francisco State (1968), the Native American Alcatraz Occupation (1969), and the decade-long ARC/AIDS Vigil at United Nations Plaza (1985-1995). 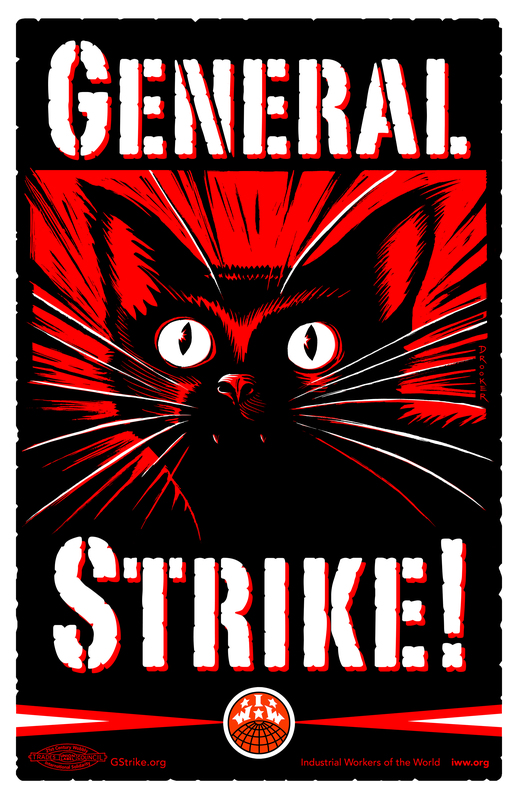 Then there's the more recent General Strike poster made by artist Eric Drooker. "I was contacted by the IWW, the Industrial Workers of the World, America’s oldest and most radical labor union," Drooker says. 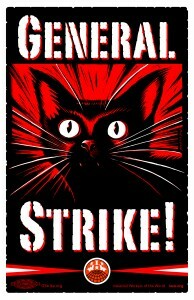 "They were calling for a general strike in Madison, Wisconsin... when the Occupy movement really started to kick in. When people were occupying the state capitol building. And it was extremely radical because you had not only the local school teachers, you had the local anarchists occupying... in solidarity with the local policeman’s union! 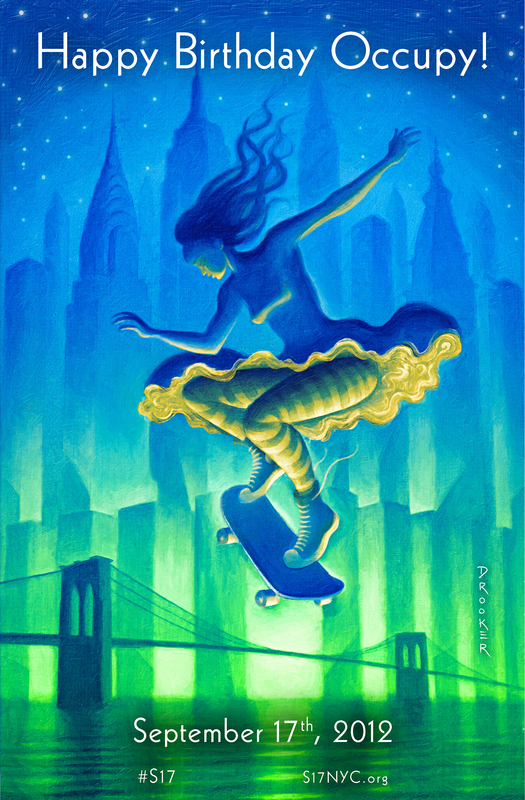 Drooker has a number of credits to his name, though he figures he's best known for his New Yorker magazine covers. Chuck Sperry is known for his rock concert posters. Naturally, he drew on that tradition for his contribution to the Occupy movement. Consider the poster to the right. Sperry went straight for psychedelic colors. An added benefit: "You can read it from about 200 feet away!" 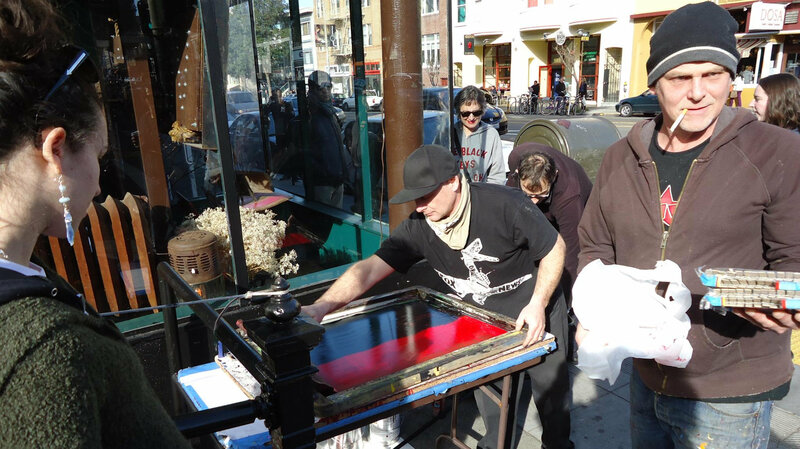 He owns his own silk screen print studio, so it's easy to make and distribute thousands of copies. He gave out 1,500 last November, when protestors headed for the port in Oakland. 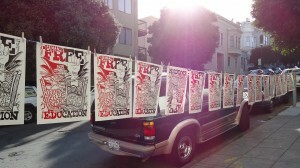 "There was just a sea of these posters," Sperry says. "It was very gratifying." Occupy isn't over for Sperry either. As Dean of the Free University Art School, Sperry invited Jon Paul Bail to join in teaching a class called "Occupy Art." The vision, quoting from Sperry's website: "The Free University of San Francisco aims to make the highest level of education available, completely free, to any individual who wants it, regardless of color, creed, age, gender, nationality, religion or immigration status—a university free of money, taught for free. The only requirement for membership is a desire to teach and/or a desire to learn." 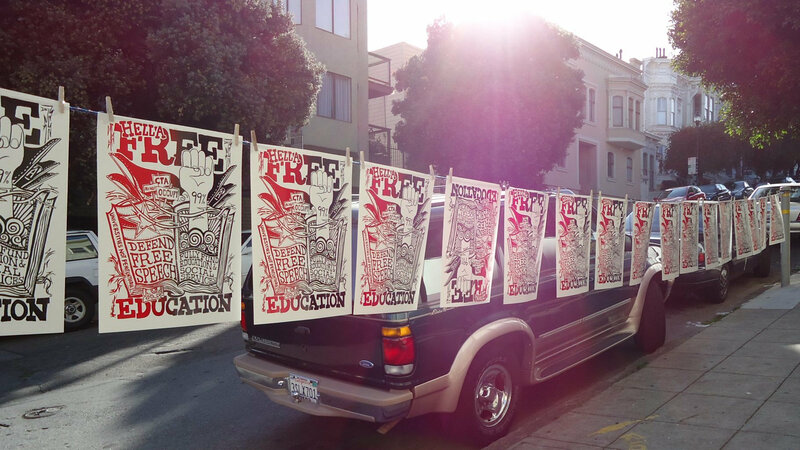 The two artists created a piece called "Hella Free Education,"
but more than that, they literally brought the production process to the streets; in this case, Valencia Street. Occupy means many things to many people. On the California Report, we've covered a multitude of mini-movements that Occupy has spawned, focused on everything from freedom of speech to police brutality to the foreclosure crisis to genetically modified food. "In a sense, it is like a Rorschach test," says Drooker. "But the fact that it’s called Occupy Wall Street – we shouldn’t forget that behind it all, it really is [about] economic disparity, and the concentration in fewer and fewer hands of wealth in recent decades – that people are responding to." The exhibit continues through October 14th. There's a panel discussion at the museum September 21. The museum is taking suggestions as to questions through Thursday on Facebook.